Seifert, Praga, Czechy : Rezerwuj teraz! gratuity - every 21st. pax in multibedded room. 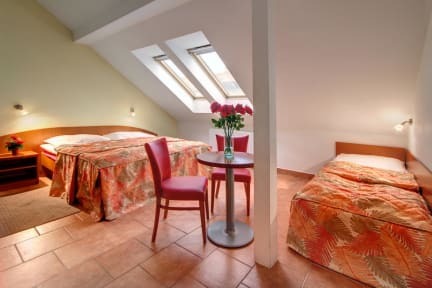 Hotel Seifert is located in the center of Prague, just a short walk from the Wenceslas Square, the Main railway station and the international bus station Florenc. 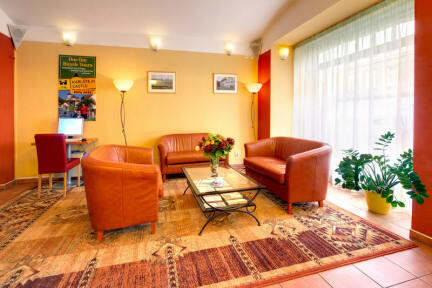 It is a modern hotel with thirty modern rooms and underground parking. Visitors will especially appreciate its location, right next to the hotel there is a public bus stop offering a direct connection to the river banks near the Manes Bridge. Services: Reception with 24-hour service, Taxi, transportation services, Exchange services, Sightseeing tours and excursions, Laundry, Safe-deposit storage free of charge and Bike rentals. Parking slots available in the garage for 300 CZK. Our functionally equipped rooms with modern furniture feature Bathroom (shower, WC), Satellite television, Telephone, Hair dryer, In-room safe deposit free of charge, Minibar, Ceiling fan, Tea & coffee making facilities free of charge and Toiletries free of charge.